Baratza Virtuoso 586 is another great grinder provided by Baratza, a Seatle based company that focuses on nothing but coffee grinders. It is famous for excellent customer service. The Virtuoso 586 is an upgrade to the previous 585 with an improved gearbox and with 40mm conical burr. It provides great consistency and good grind speed. 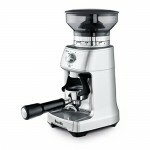 It has 40 different grind settings which will enable you to use various brewing methods. Another great thing about the grinder is that it reduces noise a lot. It has also durable 240W motor. At the price 229$ you get a quality grinder for that range of price. 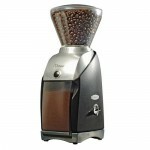 The grinder has a 40mm hardened steel conical burr. They grind coffee at 1.5 to 2.4 g/sec, depending on the setting. They are good for espresso, drip, manual brewing methods and Press Pot. Burr was manufactured in Liechtenstein. Burrs are comparable with the highest quality commercial burrs. DC motor keeps beans cool, even during extended grind times, while a combination of electric and gear speed reducers slow the burr to 450 RPM, ensuring a smooth bean feed and reducing noise, heat and static buildup which helps making a consistent grind. With unique speed control, the Virtuoso uses a combination of gear and electronic speed reduction to control the rotation of the burr to 500 RPM. The electronic speed controller is adjustable from 405 to 495 RPM in the event that specific user conditions require modification of the speed. Motor turns slowly resulting in cool, quiet operation and permits long grinding duty-cycles. Also metal exterior helps reducing noise a bit. 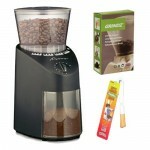 In general it is relatively quiet grinder for the price. Hopper holds 8 ounces (250g) of beans and can also be extended. It’s made of ABS plastic with a cone-shape to allow beans flow into the burr easily. 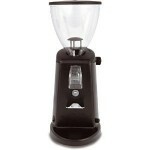 This is a big hopper size which will allow you to make plenty of coffee with one flip of the switch. The ground coffee container is smaller than the bean hopper with 5 ounces in capacity. There are 40 different individual settings that will enable you to dial into your specific grind. The grind is controlled with either a pulse button being pressed down in the front or a timer of 60 seconds on the right hand side. It has a metal casing and the hopper is made of ABS plastic. It is manufactured in Taiwan. This gives a grinder a weight of 8 pounds, which is slightly heavier than some competing products on the market. Also restoration parts are cheap. Burrs are easily removable with no tools, making cleaning very easy. You can remove the bean hopper to have easy access to the bottom burr. It is recommended to use a dry brush (which comes with the product) to extend the product’s lifespan. Baratza offers a one year guarantee from the date of purchase. This warranty covers all defects in materials and workmanship (parts and labor) including free ground transportation to and from their repair facility within the US and Canada. You can reach them via email support@baratza.com or call 425-641-1245. 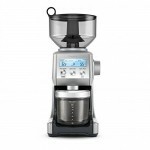 For additional warranty, support, or troubleshooting information, go to www.baratza.com. Also international warranty, support and service is available at their local retailers. User Manual in English, French, Dutch, German and Spanish, a cleaning brush and a 3-pack 35G Grindz Coffee Grinder Cleaner. Most of the consumers are satisfied with purchase. They do not encounter problems a lot and Baratza also has a great customer service which helps them a lot. Majority of the customers did not encounter problems and if some problem is encountered many times, Baratza usually reads reviews and fixes the product in that way. Baratza Virtuoso 586 is an improvement of the version 585. It has improved grinding speed and consistency. It is easy to clean, has good materials, good customer service and does not make too much noise. It also allows many adjustments with 40 different adjustments. It has some drawbacks though, for example the machine could heat if you leave it to run for over a minute in case you need a lot of coffee at once. In general it is a good product for the price of 229$. Consistent grind for different brewing methods and fine enough for espresso.